The people over the road are moving out, the whole kit and caboodle: the chairs and beds, the IT paraphernalia, cat-basket, books, tele’ and lawn mower. In the year I’ve lived here I’ve been aware of at least half a dozen such moves. Once an aquarium left and a drum kit moved in, though thankfully that was at the other end of the street. No sooner will this lot of vans and over-loaded cars drive away than the incomers will show up and carry in a set of belongings that are at one and the same time identical to the outgoings items and yet, utterly different. The items may be the same, but the assemblage and its meanings will be unique to that household. I use the word ‘belongings’ in the preceding paragraph because I think that most accurately describes our relationship with our ‘stuff’. To speak of ‘possessions’ suggests it’s a one way arrangement, and fails to make due allowance for the power we grant to our objects, particularly those in our homes. They are an expression of our subjectivity, but because we set them within a mesh of associated practices they have agency in constructing our identity. They perform a mediating function in the circumstances of our lives, but they’re not impartial in that mediation. It was an interest in such processes of domesticity that prompted my investigation into the home-making practices of a specific sort of British women living in colonies of the British Empire (Genteel women: empire and domestic material culture, 1840-1910). The women concerned were members of social elites, who adhered to a set of values, a highly nuanced form of knowledge known as gentility. Such individuals deemed themselves to be in a position of superiority, elevated above those around them, who were, by definition, considered to be ‘vulgar’. Genteel values were expressed through modes of behaviour in conjunction with material means. Put simply – they were accustomed to having access to, and using, a lot of ‘stuff’. Their ‘belongings’ were critical in negotiating the circumstances of their lives. How, I questioned, had such women not merely survived, but actually prospered when faced with the rigours of and, by their terms of reference, material deprivation of colonial life? I wanted to see how their physical environments impacted on their cultural landscape. I identified genteel women who lived in the temperate zones of Aotearoa/New Zealand, south Australia and southern Africa and in the sub-tropical and tropical regions of northern Australia, India and West Africa. Selecting the geographical and temporal range – c1840-1910 – permitted inclusion of women living in long-established British communities in India, the expanding and consolidating colonies of southern Australia and New Zealand and in newly emergent settlements of northern Australia and West Africa. All the women I wrote about had relocated to set up homes in the company of a man to whom they were related by either blood or marriage. Their menfolk were working ‘out in the colonies’ – be it in a military, commercial, administrative or agricultural capacity – and one of the women’s primary functions was to support the men in their endeavours. Certainly his successes or failures would have been hers, but so too her contribution could develop and extend – or, horror of horrors, actually undermine their joint enterprise. With so much hanging on their domestic management how had these women gone about not just setting up home, but actually making themselves feel at home? Where did they source all that complex material culture they held so dear? I chose to investigate their dress, living rooms, gardens and food management because they were the four areas seen by contemporaries as being the quintessential elements of genteel womanhood. I started with such questions as: how did they get hold of a new corset, a set of dinner plates, living room curtains or seeds for the garden, when a thousand miles or more and an ocean away from the retail riches of nineteenth century Britain, and what strategies evolved when one simply could not get hold of such items? The answers proved illuminating and a complex picture emerged, with gentility – both its ideology and expression – proving to have been responsive and adaptable to the many environmental changes it encountered. The women not only brought to bear a whole range of cultural competences acquired in their previous homes, they also developed different forms of genteel behaviours and practices as befitted their new location. Most striking of all, it’s evident that many women didn’t just become competent in the colonial site they developed a ‘sense of self’ in situ and became firmly attached to their new homes. Perhaps it’s because the Spring sun is shining on my own garden that my thoughts turn to the work I did on the colonial women’s gardening practices. Initially I had my doubts as to whether I would be able to locate sufficient traces of this area of their homes, for by their very nature the gardens are long gone. My anxieties proved groundless, for the women so relished their gardens that they wrote about them constantly, and in great detail, in their letters and journals. Sarah Courage, who lived in New Zealand for 26 years, wrote ‘Whatever the employments of the day, I always contrived to find a little spare time for the flowers’ and Adela Stewart, who had been a complete novice on her arrival in the country subsequently reported ‘At the end of our 4th year I had become an enthusiastic gardener, and so continued, finding far more pleasure in growing flowers, vegetables and trees than in any other occupation.’ In addition to the women’s personal writing I was able to draw on seed and plant catalogues from Britain, Australia and India, gardening manuals from India and South Africa, memoirs from Nigeria and paintings and photographs made in Australia, India and New Zealand. There is ample material to underpin the argument that the spaces and practices of the women’s gardens had agency for the expression of gentility, and were highly significant in furthering these migrants’ attachment and sense of being at home, though far from ‘Home’. 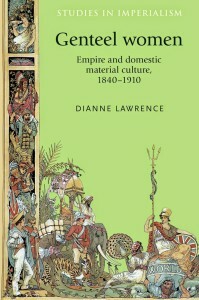 Dianne Lawrence is an Independent Scholar and the current holder of the Meryl Huxtable Bursary, as awarded by the Wallpaper History Society. Genteel women: Empire and domestic material culture, 1840–1910 is now available in paperback. Category: Anthropology, Cultural Studies, History	0 Comments.